SO... What Do I Have Here Today ? Thanks for visiting. Copyrights (c) Nira Dabush. A NICE CAPTURE OF YOUR WORKSHOP, NIRA !!! great photo,mervelous studio. perfect place for doing excellent works. Artist Reply: Dear Yves.. I used to paint on this table very many years, and it changed it was bigger in the past. 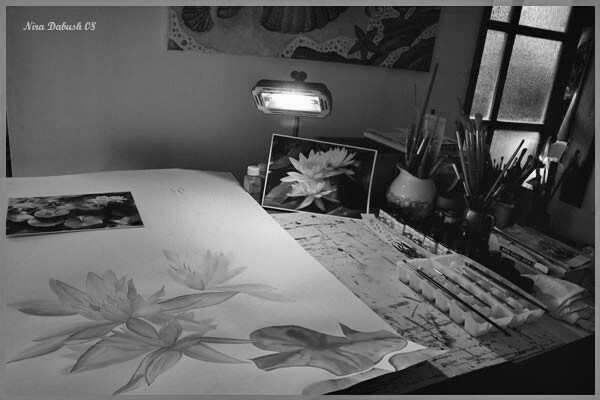 Nowadays, I paint mostly in my studio, and doing digital and photography on this table. ( it is located in the living room of our apartment. Thanks for visiting. Artist Reply: Hello Al... Thanks for visiting. Indeed it's my works of art,. that I enjoy doing. Yet it is not my studio, but my home.. At this table, nowadays there's a computer, which I hoped safe from others to see... But it seems it's not safe enough as I thought. Here I work mostly on digital and photography works... in the past, few years back I worked also here, In this photo, which was taken in colours in 2008. My paintings are painted more in my studio these days. KInd regards. DELIGHTFUL WORK TODAY MY FRIEND. Artist Reply: Thanks, Joanie... Kind regards.